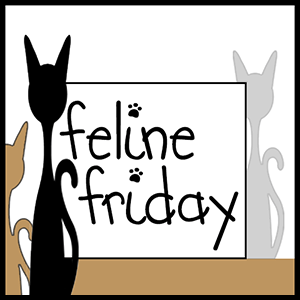 This entry was posted in A-Z Blog Challenge, Blog Hops and tagged A-Z Blogging Challenge, Feline Friday, fivesibes Flashback Friday, Friendly Fill-ins, friendship friday blog hop, Phoebe, Snowball by pilch92. Bookmark the permalink. I luv cleaning up spilled cat food! Had to laugh about the spilled cat food. Here, the dog races the cats to get it when she is around. Nice photos of your angel cats. We’ve had cats with kidney issues, one needed subq fluids daily. It’s not easy but good care helps. Those are sweet photos of your angels. I have never been supple enough to do backbends, but on a good day (when my meds haven’t made my joints lock) I can still touch the floor with the flats of my hands. Binga has CKD, but it has been stable for quite a while now. So far, she hasn’t needed fluids. I am glad she is stable. Meowser Ms. Ellen those were good answers. In our house, Saphera is more likely to beat us kitties to any food spill. I have concluded that she probably doesn’t even bother to check if what she is ‘hoovering up’ (the staff’s term) is actually food…. This is also why she was on a diet for over a year. I hope you have a lovely weekend and purrticularly fine Palm Sunday. Super filling in….you’re right about spilled cat food – in your house I’m sure that’s NEVER a problem cleaning up!!! I seem to remember in the deep dark distant past I could do a back bend – these days I’m afraid I’d NEVER recover if I tried! Those are two sweet photos! I could never do a backbend! 1. I used to be able to spend a lot time in the sun, but I no longer can. 2. I just can’t seem to give up those pesky carbs. 3. I’m notorious for being a procrastinator. 4. There is no use in crying over the things I can’t do anymore. I have found other thing I love to do. We so like your fill-in answers. Never have to worry about leftover cat food around here, there is always some kitty kat to clean it up. You all have a super day. Those were fun answers and super sweet bunnies too. Great fill ins. #2 sounds like me – I can’t concentrate on things these days. Definitely agree with #4 and spilled cat food. Have a great weekend! I expect Tilly’s kidneys will be her downfall, but she’s doing okay so far. Be well, my dear! The junk food comment made me laugh. I am glad she is doing well right now. Aww, great shots of angels Phoebe and Snowball. Alas, madame Colette didn’t get the memo on spilled cat food. If it is on the floor, it is for the human to clean up. We loved seeing Angels Phoebe and Snowball! Our mom’s answer number 1 is that she used to be able to read without her glasses. No more! Thank you. I need glasses for reading now too. 1. I used to be able to get off the floor easily, but I no longer can. 2. I just can’t seem to stop eating food that’s bad for me. 3. I’m notorious for getting into trouble. 4. There’s no use crying over things you can’t change. Thanks for co-hosting Friendly Fill-ins. Your A to Z is so informative. We need to bookmark all these sites. TW is scared I’m gonna get something kidney related since I drink so little. Four paws up for the #4 fill-in. Our mom discovered that CRF site back in the early 2000s, when her little Sophie was diagnosed. It is a very helpful site. It is a great site that I hope no one needs. Too funny! We’re running our answers on Sunday this week but our #4 is nearly identical! Great answers! Count us in to clean up that cat food!! Love the angel bunny photos! Bittersweet reading as Orbit suffered with kidney issues. Great information, though. So cute:) Thanks for the website on kidney disease. Mookie was diagnosed last year. He has lost a lot of weight and muscle, but is doing okay with the meds and food. Angel’s nickname is Bunny Rabbit; wonder if I could get her to wear bunny ears?!? I would love to see her in bunny ears. Tanya’s site if the Go To site for kidney stuff. Gracious of you to mention it as an important place. It is an excellent site. These two angels look so adorable in their pink bunny ears…I think I will save their pictures to enjoy from time to time. I will read the Kidney disease link. It has hurt all my babies since the get-go. That link is so good, I am saving it and about to send it to someone who will lose her girl tomorrow. She is devastated. I’m in tears reading all of this too. Awww Angel Phoebe and Angel Snowflake are such beautiful kitties and bunnies. Tiglet and The Soot Sprites, and Petra, too, make great vacuum cleaners when we have an oopsie around here. They are pretty good at causing them, too. 🙂 Drac was sitting in the shadows of the kitchen right in the walkway the other day. I was on the way to the microwave with a bowl of ramen. I didn’t see Drac and tripped on him. He scratched me something good and the soup went flying everywhere. Thankfully, I didn’t drop the bowl! Before I had recomposed myself, the furbabies had removed all need for the vacuum cleaner! I did acrobats/gymnastics as a child, and I miss being that flexible. Those were the days. At our house, it’s a toss up whether the cats or dog will eat spilled cat food. And I am so glad you mentioned Tanya’s site on kidney disease in cats. I used that site frequently after my angel Rosie was diagnosed with kidney disease. And we can’t get enough of you adorable Catburry Bunnies! 1. I used to be able to speak decent Spanish, but I no longer can. 2. I just can’t seem to get much attention, locally, for my writing….but I ain’t giving up! 3. I’m notorious for my sense of humor. 4. There’s no use crying over the lack of traffic for one’s writing…just keep at it, just keep being creative….never give up! Thank you for these great answers. I agree, never give up.